Set in the heart of Estes Park in Colorado, Taharaa Mountain Lodge is a rustic lodge that offers an authentic mountain getaway. Nestled into the mountainside, the log and stone bed and breakfast-style inn feature floor-to-30-foot-ceiling windows that embrace breathtaking panoramas of the surrounding mountain peaks, tastefully appointed accommodations with log-burning fireplaces, and private decks and modern amenities. 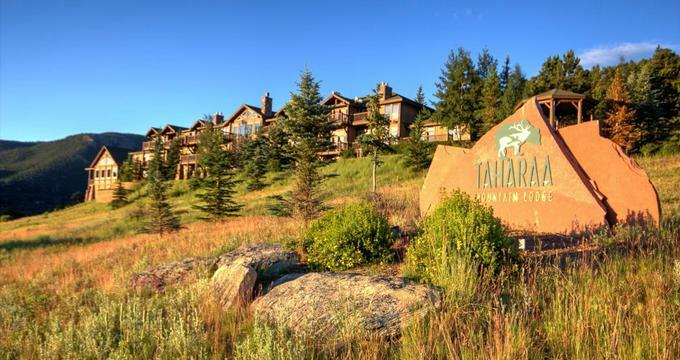 The Taharaa Mountain Lodge offers a variety of recreational and outdoor activities such as hiking and mountain climbing, as well as shopping and exploring the art galleries of the nearby downtown Estes Park. Taharaa Mountain Lodge features a variety of beautifully appointed guest rooms and suites, ranging from Queen and King Lodge Rooms to Steam Shower and Jacuzzi Junior Suites. All rooms have rustic, mountain lodge style décor and Native American-inspired furnishings, comfortable beds with plush linens, and private bathrooms with walk-in showers and/or soaking tubs. Rooms and suites have balconies with tables and chairs and beautiful mountain views. All rooms have modern amenities, including air-conditioning, flat panel televisions with cable channels, hair dryers, irons and ironing boards, and complimentary wireless Internet. Guests have access to a shared guest refrigerator and vending room, a spa room with a hot tub and dry sauna, and an outdoor hot tub. The Taharaa Suite is a luxurious retreat that captures the beauty of Colorado with two sumptuously appointed rooms decorated in a Southwestern theme. The Suite features a master bedroom with a beautiful king-size bed with plush linens, an en-suite bathroom with double vanities, a walk-in shower for two and a corner Jacuzzi tub. A spacious living room has a Tao's drum coffee table, a secretary-style writing desk, oversized armchairs, and a double-sided fireplace. The Cattle Baron Suite is an elegant two-room suite that embraces the spirit of Western ranch life with authentic décor and furnishings and a private deck with spectacular views. The Suite features a spacious living room with a leather sofa, stone fireplace and wet bar, and a master bedroom with a luxurious four-poster king bed, beautiful wood-inlaid armoire, and a gas fireplace. An en-suite bathroom has a Jacuzzi tub with mountain views, large glass-encased shower, and deluxe bath products. The Steam Shower Suites are handsomely appointed junior suites with Western-inspired décor and furniture such as leather loveseats, custom writing desks and chairs, and gas fireplaces. Bedrooms feature king or queen-size beds with luxurious linens, and en-suite bathrooms with double steam showers and deluxe bath products. Jacuzzi Junior Suites exude the ambiance of the Old West with aspen log king-size beds, en-suite bathrooms with corner Jacuzzi tubs, walk-in showers, and deluxe bath amenities, and spacious living areas with Western-inspired furniture such as oversized armchairs, double recliners, and gas fireplaces. A sumptuous breakfast is served every morning and includes fresh fruit and juices, hot coffee and tea, a selection of pastries, muffins and freshly baked bread, egg dishes, and more. A Social Happy Hour is provided every evening from 5:00 pm to 6:00 pm year-round and includes wine, beer, and soda served in the Lodge’s Den. Taharaa Mountain Lodge offers a range of amenities, including a complimentary breakfast served every morning, drinks and appetizers in the Den every evening, and various locations for weddings, meetings, gatherings and other functions and events. Recreational activities range from hiking, horseback riding, fishing, and wildlife viewing in the summer months, to skiing, snowshoeing and cross-country skiing during the winter. There are numerous festivals and events held throughout the year, as well as galleries, museums, shops, and great restaurants in the area to explore. Taharaa Mountain Lodge offers a beautiful location for weddings, receptions and other special events and functions. The Lodge’s Great Hall offers a spectacular venue for weddings and gatherings of up to 150 guests with a variety of packages and services included and breathtaking views. The Taharaa Mountain Lodge also caters for business functions and events with a modern meeting room and the Great Hall, which can accommodate 12 and 100 participants, respectively.